Today we present five sure-fire healing secrets from deepest China that you might be able to use to battle the nasty yet formidable common cold. To have these secrets under your belt means you are truly in the know. This Far-East herb may stimulate your immune system. In 1918, andrographis was credited in India with saving lives during the flu pandemic that spread around the world. It contains active ingredients that spark your immune system into action, kind of like an alarm clock. Andrographis may shorten colds and flu, and relieve symptoms in the process. Compared to placebo, time and time again, this herb has led to significant reductions in symptoms — particularly fatigue, sore muscles, headache, and runny nose. In a slew of recent studies, researchers have found that the herb successfully reduced symptoms of the common cold. RECOMMENDED: Could Canada’s Cold-Fighting Secret Really Work? This great formula, containing 10 herbs, is a classic in China. You might see it called “Lonicera & Forsythia Formula.” It is proven to reduce fever, help sweat out the virus, soothe coughing, bring down inflammation, and kill pain. On the cold front, researchers tested powdered formula in 1,150 people. After just one day, fever dropped for everyone, mild cases improved significantly, and bad cases became more mild — and cleared up in an average of 2.7 days. For flu, “Yin Qiao Sun” was tested in 50 people and proved to lower body temperature and improve many symptoms. 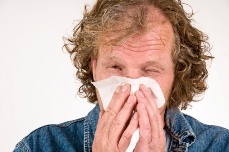 Patients were flu-free in as little as two days. This famous herb, originally from China, could prevent the flu — when you gargle it. One study found that older adults who gargled with green tea “catechins” were far less likely to fall ill with influenza. larger study, with 450 patients, just four acupoints treated once a day led to improvements across the board within just two days.